John Ross Robertson, an influential journalist, has been called the Father of Amateur Hockey in Ontario for working to protect hockey from being professionalized. Born in Toronto, he attended Upper Canada College where he started The College Times, the first school newspaper in Canada. He became city editor of The Globe in 1865 and, the following year with James B. Cook, established The Daily Telegraph. In 1876, Robertson founded The Evening Telegram, which quickly became one of Toronto's leading newspapers. He assembled an invaluable historical and pictorial collection and published such notable works as Landmarks of Toronto and History of Freemasonry in Canada. An advocate of sport and a promoter of amateur hockey, Robertson was appointed president of the Ontario Hockey Association (OHA) in December 1899. 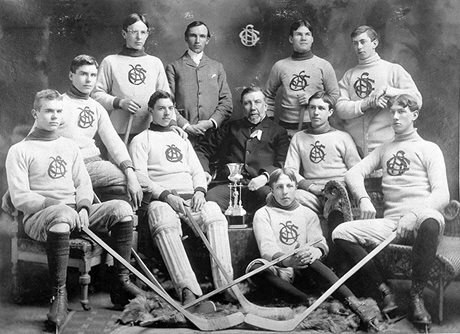 He was made a life member of the OHA in 1907, and donated three trophies to the sport. Visit the Ontario Heritage Trust provincial plaque on the grounds of his former home at 291 Sherbourne Street in Toronto, Ontario. Read Robertson’s biography on the Hockey Hall of Fame website. Learn more about the John Ross Robertson collection at the Toronto Public Library.